Raheem Shaquille Sterling (born 8 December 1994) is an English professional footballer who plays as a winger and attacking midfielder for Premier League club Manchester City and the English national team. Born in Jamaica, Sterling moved to London at the age of five and began his career at Queens Park Rangers before signing for Liverpool in 2010. In July 2015, following a lengthy dispute over a new contract, he was signed by Manchester City in a transfer potentially worth £49 million, the highest transfer fee ever paid for an English player. He then went on to help Manchester City win the Premier League in 2018. Raheem Shaquille Sterling (born 8 December 1994) is an English professional footballer who plays as a winger and attacking midfielder for Premier League club Manchester City and the English national team. Born in Jamaica, Sterling moved to London at the age of five and began his career at Queens Park Rangers before signing for Liverpool in 2010. In July 2015, following a lengthy dispute over a new contract, he was signed by Manchester City in a transfer potentially worth £49 million, the highest transfer fee ever paid for an English player. He then went on to help Manchester City win the Premier League in 2018. Sterling made his senior debut for England in November 2012 after previously being capped by England youth teams at under-16, under-17, under-19 and under-21 levels. He was chosen in England's squads for the 2014 and 2018 FIFA World Cups and UEFA Euro 2016. Sterling was born in the Maverley district of Kingston, Jamaica, and spent his early years there. At the age of five, he emigrated to London with his mother, and attended Copland School in Wembley, North West London. His absent father was murdered in Jamaica when Sterling was two years old. Sterling was signed by Liverpool from the Academy at Queens Park Rangers in February 2010 by Rafael Benítez for an initial fee of £600,000, with the possibility of rising up to £5 million depending on how many appearances he made for the first team. Sterling played in the youth team, scoring his first goal in a friendly against Hibernian in a 2–2 draw. His first Premier Academy League match was a 2–2 draw against Aston Villa, his first win coming at home to Bristol City a week later. On 15 December, Sterling scored in the FA Youth Cup in a 4–0 win over Notts County. On 14 February 2011, Sterling scored five goals in a 9–0 win over Southend United. 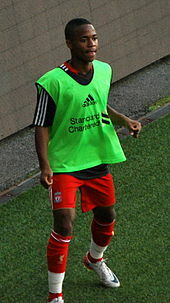 On 24 March 2012, Sterling made his senior Liverpool debut as a substitute in a league match against Wigan Athletic, aged 17 years and 107 days, becoming the third-youngest player to play for the club in the process. He made two more appearances over the remainder of the campaign, again as a substitute. In August 2012, he made his European debut for the club, coming on as a substitute in a UEFA Europa League qualifying match against Gomel, replacing Joe Cole in a 0–1 away win. The following week, Sterling scored his first goal for the senior team with a first-half strike in a friendly against Bayer Leverkusen. On 23 August 2012, he started his first match for Liverpool in a Europa League qualifying match away to Hearts in a 0–1 win. He was given his first start in the league three days later in a 2–2 draw at Anfield to Manchester City. He played the full 90 minutes in the loss to Arsenal on 2 September, and the draw with Sunderland on 15 September, where he registered one assist and was named man of the match. On 19 September, Sterling was one of the group of teenagers that travelled to Switzerland to play Young Boys in a UEFA Europa League group match. He replaced Stewart Downing in the second half as Liverpool won 3–5. On 20 October, Sterling scored his first senior competitive goal for Liverpool in the 29th minute in a 1–0 league win against Reading with a strike from the edge of the box. As a result, he became the second-youngest player ever to score in a competitive fixture for Liverpool, behind only Michael Owen. On 21 December 2012, Sterling signed a contract extension, committing his future to Liverpool. He scored his second league goal for the club on 2 January 2013, opening the scoring in a 3–0 win against Sunderland with a lob over goalkeeper Simon Mignolet. On 27 August 2013, Sterling scored his first goal of the 2013–14 season, the opening goal against Notts County in a 4–2 win in the League Cup. On 4 December, Sterling scored his first Premier League goal of the season for Liverpool in a 5–1 win over Norwich City. His form in December saw him score two further goals in wins against Tottenham Hotspur (5–0) and Cardiff City (3–1). On 8 February 2014, he scored twice in a 5–1 win against Arsenal at Anfield. On 13 April, he scored Liverpool's opening goal in a 3–2 win over Manchester City. A week later, he scored two goals and assisted another as Liverpool won 2–3 against Norwich City at Carrow Road. On 18 April 2014, Sterling was named as one of the six players on the shortlist for the PFA Young Player of the Year award. He was named Liverpool Chartered Player of the Month for April. At the end of the season, he was named Liverpool's Young Player of the Year. On 17 August 2014, Sterling scored to help Liverpool to win their opening match of the 2014–15 season, a 2–1 win at home to Southampton at Anfield. On 31 August, Sterling scored the opening goal in a 0–3 league win against Tottenham at White Hart Lane and was named man of the match. Sterling was named the Liverpool Player of the Month for August. On 16 September, Sterling made his UEFA Champions League debut in a 2–1 victory over Bulgarian champions Ludogorets Razgrad at Anfield. On 14 December 2014, he made his 100th appearance for Liverpool in a match against Manchester United at Old Trafford. On 17 December, Sterling scored a brace in a 1–3 victory over Bournemouth at Dean Court in the League Cup quarter-final. On 20 December, Sterling was named as the recipient of the 2014 Golden Boy award. "It's down to hard work. I'm really happy that people are recognising that I'm trying to work hard and do my best for this football club. I'm really grateful for this award," he stated upon receiving the award. Sterling was officially excused from Liverpool's FA Cup match against AFC Wimbledon in January 2015, with manager Brendan Rodgers aiming to prevent the player becoming exhausted. He used the time off to holiday in Jamaica. 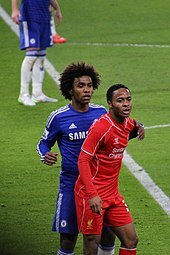 On 20 January 2015, Sterling scored a fine solo goal against Chelsea in a 1–1 draw in the League Cup semi-final first leg at Anfield, going past Nemanja Matić and Gary Cahill before beating Thibaut Courtois to find the net. On 31 January, Sterling scored the opening goal in a 2–0 win over West Ham United. On 4 February, Sterling scored the equaliser against Bolton Wanderers at the Macron Stadium in a 1–2 away win for Liverpool. On 22 February, he scored the second goal for Liverpool in a 0–2 win over Southampton. On 13 April, Sterling opened the scoring in a 2–0 win over Newcastle United. He was named the team's Young Player of the Season on 19 May for the second consecutive year in a row, and when receiving the award was booed by fans due to his rejection of a new contract; he was also booed on 7 June, while playing for England in Dublin. On 16 April 2015, for the second consecutive year, he was named as one of the six players on the shortlist for the PFA Young Player of the Year award. On 9 February 2015, Brendan Rodgers said that Sterling had been offered "an incredible deal" to stay at Liverpool, rumoured to be a new contract worth £100,000 a week, but he also stated Liverpool were "certainly not a club that is going to give way, way above what a player is worth at a certain time in their career." However, on 20 March, Rodgers said Sterling's contract situation would not be resolved until the summer at least. On 1 April, Sterling gave an unsanctioned interview with the BBC, where he confirmed he had turned down a new deal, but denied that this was for reasons of money. He had two years of a £35,000 per week contract remaining and said that he would not negotiate a new contract until the end of the season. Four days later, Brendan Rodgers slammed Sterling's advisors (Aidy Ward) on the interview, saying, "You are not a 20-year-old boy and you pick up the phone and ask to speak to the BBC. You don't do it. Him in particular. But, of course, if he is asked to do that by other parties then that is what he'll do." On 21 May, amid rumours that Sterling intended to leave the club his agent, Aidy Ward gave an interview to the London Evening Standard saying, "I don't care about the PR of the club and the club situation... He is definitely not signing. He's not signing for £700, £800, £900 thousand a week." On 11 June, Liverpool reportedly rejected an initial bid of £30 million from Manchester City. One week later, they reportedly rejected a second bid from City for £40 million, with Liverpool valuing Sterling at £50 million. Sterling reportedly later asked to be left out of Liverpool's preseason tour to Asia, and missed two days of training through illness, which was met with widespread criticism from former Liverpool players, including Steven Gerrard, Jamie Carragher and Graeme Souness. On 12 July 2015, a deal was agreed for his transfer to Manchester City for an initial £44 million, with a further potential £5 million in add-ons, subject to personal terms and a medical, which would make him one of the most expensive transfers of all time. On 14 July, Sterling officially joined Manchester City, signing a five-year contract. His debut came on 10 August, starting as City began the season with a 0–3 win away to West Bromwich Albion. Nineteen days later, Sterling scored his first competitive goal for Manchester City in a 2–0 defeat of Watford at the City of Manchester Stadium. Sterling scored his first career hat-trick as City beat Bournemouth 5–1 on 17 October. On 3 November, Sterling scored his first UEFA Champions League goal in a 1–3 win away to Sevilla. On 8 December, he scored twice in the final ten minutes of City's last group stage fixture against Borussia Mönchengladbach, helping turn a 1–2 deficit into a 4–2 win and ensuring City overtook Juventus in the final group standings. On 20 March 2016, he suffered a groin injury in a 1–0 loss to rivals Manchester United, and was ruled out for 8 weeks. Sterling eventually lost his place in the starting line-up. He failed to feature in any of the most effective performers of the 2015–16 season, and was considered one of the worst signings of the season. Sterling appeared regularly for Manchester City under Pep Guardiola for the opening matches of the 2016–17 season. He was Premier League Player of the Month for August 2016 after he scored two goals and provided one assist in three games. On 21 February 2017, Sterling scored the opener before setting up a goal for Sergio Agüero in a 5–3 home win against Monaco in the Champions League. On 26 August 2017, Sterling scored the winner in a 2–1 away win away to AFC Bournemouth in stoppage time. He was sent off by Mike Dean with a second yellow after he celebrated among travelling supporters that had run onto the pitch. On 29 November 2017, Sterling scored a 96th minute winner against Southampton in a 2–1 home win. He scored his eighteenth and final league goal of the season during a 5–0 victory at Swansea City on 22 April 2018, his most ever at this point in his career. Following England's World Cup campaign, Sterling made an immediate return to the Manchester City starting line-up. On 12 August 2018, less than a month after starting in England's 2–0 loss against Belgium in the third place play-off, Sterling scored the opening goal in Manchester City's 2–0 away win against Arsenal. The strike was Sterling's 50th Premier League goal. On 4 November 2018, Sterling scored twice and made two assists in a 6–1 win against Southampton at home, scoring his 50th goal for Manchester City in all competitions in the process. In November 2018, he signed a three-year extension to keep him at City until 2023. In December 2018, Sterling alleged that sections of the media served to "fuel racism" with their portrayal of young black footballers. The comments emerged after Sterling was subjected to alleged racist abuse during City's 2–0 defeat at Chelsea. He started off 2019 with a 2-1 win against Liverpool, where he assisted Leroy Sané's winning goal. On 6 January 2019, he scored a goal and assisted one in a 7-0 win against Rotherham, which booked their place in the fourth round. On 20 January 2019, he headed a goal to help City win 3-0 over Huddersfield Town. On 3 February 2019, he helped assist 2 of Sergio Agüero's goal to beat Arsenal 3-1, which helped City move 2 points behind Liverpool. On 10 February 2019, he scored 2 goals to beat Chelsea 6-0 at the Etihad. On 20 February 2019, in a first leg match of the Champions League against Schalke 04, he scored the winning goal in the 90th minute in a 3-2 win. In the Carabao Cup Final on 24 February 2019, he scored the winning penalty in the penalty shootout to win the cup. Sterling's international career coincided with the introduction of the "home nations agreement." It was not until September 2009 that FIFA agreed to the proposals by the English, Northern Irish, Scottish and Welsh Football Associations to update the agreement, allowing players who were educated in their nation for five years or more to become eligible for their national team. Sterling first represented England at under-16 level in November 2009 in a match against Northern Ireland. When speaking of the possibility of playing for Jamaica, Sterling said, "When it comes to that decision, that is when I will decide, but if Jamaica calls for me, why not?" Sterling was selected to play for England for the 2011 U-17 World Cup. He scored a long-range goal in England's opening 2–0 win against Rwanda in Pachuca. He also scored against Argentina in the second round in a match where England won 4–2 on penalties. On 10 September 2012, Sterling was called up to the senior England squad for the first time for a 2014 World Cup qualifying match against Ukraine, where he was an unused substitute. In early October he was called up for the first time to the England under-21 squad and made his debut as a substitute during a match against Serbia on 16 October. He scored his first goal for England U21 on 13 August 2013, in a 6–0 win against Scotland. Sterling made his senior debut for England on 14 November 2012, starting in a friendly away to Sweden. On 5 March 2014, Sterling earned his second cap and was named man of the match as England beat Denmark 1–0 in a friendly match at Wembley Stadium. On 12 May 2014, Sterling was named in England's 23-man squad for the 2014 FIFA World Cup. In a pre-tournament friendly on 4 June, against Ecuador in Miami on his fourth cap, Sterling slid into Antonio Valencia, who reacted by grabbing Sterling's neck; both received red cards for their actions. Valencia later apologised for his reaction. On 14 June, Sterling started in England's opening group match, a 2–1 loss to Italy in Manaus, and was rated as the team's best performing player by the BBC. On 27 March 2015, Sterling scored his first senior goal for England in a 4–0 UEFA Euro 2016 qualifier against Lithuania at Wembley Stadium. On 9 October 2015, Sterling scored his second goal of the qualifying campaign in a 2–0 victory against Estonia, by which point the team were already qualified. He was one of 23 players chosen for the final tournament. He was named in the 23-man England national team squad for the 2018 FIFA World Cup. After a run of 27 games without a goal for England, Sterling scored twice in a UEFA Nations League group game against Spain on 15 October 2018. England went on to win the match 3–2. Sterling plays as a winger, attacking midfielder or striker, though he is more comfortable as a natural winger. Sterling has been praised for his adaptability and ability to play wide, at the tip of a midfield diamond and centrally, offering flexibility. Known for his pace, low centre of gravity, and dribbling skills, Sterling has been compared to Alexis Sánchez by his former manager Brendan Rodgers. Rodgers has also praised him for offering a "real threat," his use of pace with composure and his maturity. Despite his small stature, he also possesses considerable upper-body strength, which aids him in withstanding challenges, and retaining possession. Former Barcelona midfielder Xavi said in November 2014 that Sterling is good enough to play for the La Liga club, praising his physical and technical qualities. In April 2015, BBC Sport columnist Phil McNulty wrote that Sterling was "very good with the potential to be outstanding" but remained a "work in progress" due to inconsistent performances. He also wrote, "He is blessed with natural pace that makes even the best defences and defenders take a step back." In 2013, citing the influence of his mother, Sterling was quoted as saying he was "not 100 per cent religious but my belief is strong. When the time is right, I will fully be Christian." He added that he put his faith in God and that he prays regularly. He has one daughter, Melody Rose, born in 2012 after a brief relationship. On 8 August 2013, Sterling was arrested for an alleged common assault on his former girlfriend, a model. He was found not guilty at Liverpool Magistrates Court on 20 September, when the complainant was unable to offer consistent evidence. A few months earlier, on 20 May 2013, a charge of common assault on a different woman was dropped after a witness failed to turn up to court. 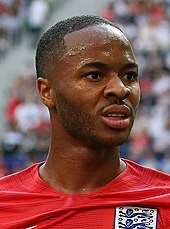 In April 2015, Sterling was photographed by the Sunday Mirror allegedly smoking a shisha pipe, and by The Sun allegedly inhaling nitrous oxide for recreational purposes. Manager Brendan Rodgers said, "I don't think it is something you should be doing, it's as simple as that...Young players make mistakes. As long as they learn from them, that is what is important." In June 2017 following the Grenfell Tower fire in which 71 people died, Sterling made a "substantial" donation to those affected by the fire. On 16 December 2017, Sterling was attacked outside Manchester City's training ground by a man who used racist language towards him. Four days later, 29-year-old Karl Anderson, a convicted football hooligan, pleaded guilty to racially aggravated common assault and was sentenced to 16 weeks in prison and a £100 fine. The Guardian praised Sterling's resilience and courage in deciding to play only four hours afterwards. Sterling has an M16 rifle tattooed on his leg. He received criticism from anti-violence groups but said that the tattoo had deeper meaning and referred to his father who was killed when Sterling was two years old. The treatment of Sterling by Britain's tabloid media, especially The Sun, has been deemed unfair and racist by pundits including Ian Wright. In 2012, Sterling signed a sponsorship deal with American sportswear and equipment supplier, Nike. He appeared in an advert for the new Nike Green Speed II alongside Mario Götze, Theo Walcott, Eden Hazard, Christian Eriksen and Stephan El Shaarawy in November 2012. In January 2013, he modelled the new Nike Mercurial Vapor IX. As of match played 18 November 2018. England score listed first, score column indicates score after each Sterling goal. ↑ "Squads for 2017/18 Premier League confirmed". Premier League. 1 September 2017. Retrieved 5 December 2017. ↑ "Raheem Sterling". Barry Hugman's Footballers. Retrieved 5 December 2017. ↑ "R. Sterling: Summary". Soccerway. Perform Group. Retrieved 15 May 2018. 1 2 Lowe, André (23 February 2011). "As Hype Grows Around Raheem Sterling". The Gleaner. Kingston. Retrieved 22 April 2011. 1 2 Hall, Arthur (1 July 2012). "Maverley's Son Liverpool's Baller Raheem's Return Inspires". The Gleaner. Kingston. Retrieved 19 May 2015. ↑ Smith, Ben. "Raheem Sterling: From school struggles to a class of his own". BBC Sport. Retrieved 20 August 2016. ↑ "Raheem Sterling, England's new wunderkind". Channel 4. Retrieved 20 August 2016. ↑ Wallace, Sam (15 September 2012). "Raheem Sterling's already a Wembley legend". The Independent. Retrieved 16 September 2018. ↑ "Raheem Sterling reveals meaning behind new gun tattoo". The Daily Telegraph. 29 May 2018. Retrieved 29 May 2018. ↑ Sanderson, David (18 June 2014). "Pride and bafflement as family see Sterling mesmerise a nation". The Times. London. Retrieved 14 December 2014. ↑ Johnston, Neil (16 February 2011). "On the Bench ... With Raheem Sterling, a Winger Catching the Eye at Liverpool". FanHouse UK. AOL. Archived from the original on 20 February 2011. Retrieved 22 April 2011. ↑ "10 things you need to know about Raheem Sterling plus video of him in action". Daily Mirror. London. 16 February 2011. Retrieved 22 April 2011. ↑ Pearson, James (15 February 2011). "Raheem sterling for Reds' youth". Sky Sports. Retrieved 22 April 2011. ↑ "Liverpool 1–2 Wigan Athletic". BBC Sport. 24 March 2012. Retrieved 24 March 2012. ↑ "Liverpool 0–1 Fulham". BBC Sport. 1 May 2012. Retrieved 10 June 2012. ↑ "Liverpool 4–1 Chelsea". BBC Sport. 8 May 2012. Retrieved 10 June 2012. ↑ Bascombe, Chris (2 August 2012). "Europa League: FC Gomel 0 Liverpool 1 – match report". The Daily Telegraph. London. Retrieved 2 August 2012. ↑ "Own goal gives Reds advantage". ESPN Soccernet. 23 August 2012. Retrieved 23 August 2012. ↑ "Liverpool 2–2 Man City". BBC Sport. 26 August 2012. Retrieved 26 August 2012. ↑ "Young Boys 3–5 Liverpool". BBC Sport. 20 September 2012. Retrieved 1 October 2012. ↑ "Rodgers reveals work behind goal". Liverpool F.C. 20 October 2012. Archived from the original on 5 September 2014. Retrieved 12 May 2014. ↑ "Sterling commits future to LFC". Liverpool F.C. 21 December 2012. Archived from the original on 24 December 2012. Retrieved 22 December 2012. ↑ "Liverpool 3–0 Sunderland". BBC Sport. 2 January 2013. Retrieved 6 January 2013. ↑ "Liverpool 4–2 Notts County". BBC Sport. 27 August 2013. Retrieved 16 September 2018. ↑ "Suarez makes history with Norwich haul". Liverpool F.C. 4 December 2013. Retrieved 4 December 2013. ↑ Sanghera, Mandeep (21 December 2013). "Liverpool 3–1 Cardiff City". BBC Sport. Retrieved 12 May 2014. ↑ McNulty, Phil (8 February 2014). "Liverpool 5–1 Arsenal". BBC Sport. Retrieved 8 February 2014. ↑ "Philippe Coutinho gives Liverpool edge despite Manchester City fightback". The Guardian. London. 13 April 2014. ↑ "Raheem Sterling's double gives Liverpool edge over Norwich City". The Guardian. London. 20 April 2014. Retrieved 20 April 2014. ↑ "PFA Player of the Year award shortlist: Gerrard and Lallana nominated". The Guardian. London. 18 April 2014. Retrieved 19 April 2014. ↑ "April Player of the Month revealed". Liverpool F.C. Retrieved 21 October 2015. ↑ "Suarez bags treble at awards dinner". Liverpool F.C. Retrieved 21 October 2015. ↑ "Liverpool 2–1 Southampton". BBC Sport. 17 August 2014. Retrieved 18 August 2014. ↑ "BBC Sport Tottenham Hotspur 0–3 Liverpool". BBC Sport. 31 August 2014. Retrieved 31 August 2014. ↑ "Revealed: August's Player of the Month". Liverpool F.C. Retrieved 21 October 2015. ↑ "Raheem Sterling". UEFA. Retrieved 21 September 2014. ↑ "Manchester United 3 Liverpool 0, match report: David de Gea the Old Trafford hero as rivals are swept aside". The Daily Telegraph. London. 14 December 2014. Retrieved 14 December 2014. ↑ Henson, Mike (17 December 2014). "Bournemouth 1–3 Liverpool". BBC Sport. Retrieved 4 April 2016. ↑ "Liverpool's Raheem Sterling wins Europe's Golden Boy award for 2014". The Guardian. London. 20 December 2014. Retrieved 20 December 2014. 1 2 "Raheem Sterling named Europe's Golden Boy after excellent year at Liverpool FC". Liverpool Echo. 20 December 2014. Retrieved 20 December 2014. ↑ "Raheem Sterling misses Sunderland for Jamaica sun". BBC Sport. 10 January 2015. Retrieved 1 February 2015. 1 2 "Sterling not the finished article". BBC Sport. Retrieved 21 October 2015. ↑ "Premier League: Daniel Sturridge scores on return as Liverpool prove too strong for West Ham". Fox Sports. 1 February 2015. Retrieved 4 March 2015. ↑ "Bolton Wanderers 1–2 Liverpool". BBC Sport. 4 February 2015. Retrieved 5 February 2015. ↑ "Southampton 0–2 Liverpool". BBC Sport. 22 February 2015. Retrieved 1 March 2015. ↑ "Liverpool 2–0 Newcastle". BBC Sport. 13 April 2015. Retrieved 21 April 2015. ↑ "Raheem Sterling wins Liverpool's Young Player of Year award". BBC Sport. 19 May 2015. Retrieved 20 May 2015. ↑ Bevan, Chris (7 June 2015). "England boss Roy Hodgson keeps faith with Raheem Sterling". BBC Sport. Retrieved 8 June 2015. ↑ "Men's PFA Young Player of the Year: Nominees". Professional Footballers' Association. 16 April 2015. Retrieved 12 June 2015. ↑ Kelly, Andy (9 February 2015). "Rodgers: Raheem Sterling has been offered 'incredible deal' to stay at Liverpool FC". Liverpool Echo. Retrieved 10 July 2015. ↑ Kelly, Andy (20 March 2015). "Rodgers:No Liverpool FC deal with Raheem Sterling before the summer – Brendan Rodgers". Liverpool Echo. Retrieved 10 July 2015. ↑ Pirks, Natalie (1 April 2015). "Raheem Sterling: Liverpool forward turns down new deal". BBC Sport. Retrieved 1 April 2015. ↑ "Brendan Rodgers slams Raheem Sterling's advisers over interview". ESPN FC. 5 April 2015. Retrieved 10 July 2015. ↑ Moore-Bridger, Benedict (21 May 2015). "Raheem Sterling's agent Aidy Ward confirms star wants to leave Liverpool: '£900k-a-week would not keep him at Anfield'". London Evening Standard. Retrieved 10 July 2015. ↑ Smith, Ben (18 June 2015). "Raheem Sterling: Man City's second bid rejected by Liverpool". BBC Sport. Retrieved 10 July 2015. ↑ "Raheem Sterling: Steven Gerrard 'disappointed' with Liverpool man". BBC Sport. 10 July 2015. Retrieved 10 July 2015. ↑ Souness, Graeme (21 May 2015). "Raheem Sterling turning his back on Liverpool". BBC Sport. Retrieved 10 July 2015. ↑ "Raheem Sterling: Man City sign Liverpool winger in £49m deal". BBC Sport. 14 July 2015. Retrieved 4 April 2016. ↑ "Man City transfers: Blues agree £49m Raheem Sterling deal". Manchester Evening News. Retrieved 4 April 2016. ↑ "Raheem Sterling: Man City sign Liverpool winger in £49m deal". BBC Sport. 14 July 2015. Retrieved 14 July 2015. ↑ "West Brom 0–3 Man City". BBC Sport. 10 August 2015. Retrieved 10 August 2015. ↑ "Raheem Sterling scores his first goal for Manchester City – but doesn't want to talk about it afterwards". The Daily Telegraph. London. 29 August 2015. ↑ "Manchester City's Raheem Sterling hits hat-trick in rout of Bournemouth". The Guardian. London. 17 October 2015. ↑ "Sevilla 1–3 Manchester City: Pellegrini's men reach last-16 after Sterling, Fernandinho and Bony goals". Daily Mirror. London. 3 November 2015. ↑ "Manchester City 4–2 Borussia Mönchengladbach". BBC Sport. 8 December 2015. ↑ "Raheem Sterling could miss rest of Manchester City's season – source". ESPN FC. Retrieved 23 March 2016. ↑ Robson, James (19 March 2016). "Manuel Pellegrini explains why Raheem Sterling has been dropped to the bench". Manchester Evening News. Retrieved 20 May 2016. ↑ "Premier League 2015–16: The season that defied expectations". BBC Sport. 18 May 2016. ↑ "Premier League: Raheem Sterling – The Worst Signing of the Season". Yahoo Sport. 18 May 2015. ↑ "Raheem's rebirth – how Pep has turned Sterling into a star again". 9 September 2016. Retrieved 9 September 2016. ↑ "Sterling voted EA SPORTS Player of the Month". Retrieved 9 September 2016. ↑ "Manchester City 5–3 Monaco". BBC Sport. 21 February 2017. Retrieved 19 December 2017. ↑ "Raheem Sterling strikes late to earn Man City victory at Bournemouth". ESPN FC. 26 August 2017. ↑ "Manchester City 2–1 Southampton". BBC Sport. 29 November 2017. Retrieved 23 November 2018. ↑ Sanders, Emma. "Manchester City 5–0 Swansea City". BBC Sport. Retrieved 13 August 2018. ↑ "Arsenal vs. Manchester City 0–2". Soccerway. Retrieved 7 October 2018. ↑ "Sterling reaches 50 Premier League goals with Arsenal strike". Goal.com. 12 August 2018. Retrieved 23 November 2018. ↑ "City 6–1 Southampton: Brief highlights". Manchester City F.C. 4 November 2018. Retrieved 23 November 2018. ↑ "Raheem Sterling: Manchester City forward signs three-year contract extension". BBC Sport. 24 November 2018. ↑ Fifield, Dominic (9 December 2018). "Raheem Sterling accuses media of 'fuelling racism' after alleged abuse". The Guardian. ISSN 0261-3077. Retrieved 9 December 2018. ↑ "Manchester City vs. Liverpool". ESPN. Retrieved 27 February 2019. ↑ "Manchester City vs. Rotherham". ESPN. Retrieved 27 February 2019. ↑ "Huddersfield Town vs Manchester City". BBC. Retrieved 27 February 2019. ↑ "Man City 3-1 Arsenal". SkySports. Retrieved 27 February 2019. ↑ "Man City 6-0 Chelsea". SkySports. Retrieved 27 February 2019. ↑ "Schalke 04 vs. Manchester City". ESPN. Retrieved 27 February 2019. ↑ "Chelsea vs. Manchester City". ESPN. Retrieved 27 February 2019. ↑ "Driver eligible for Scotland". Daily Mirror. London. 11 October 2009. Retrieved 6 October 2013. ↑ "Raheem Sterling profile". The Football Association. Retrieved 6 October 2013. ↑ Hall, Arthur (11 November 2009). "Jamaican takes UK youth football by storm". The Gleaner. Kingston. p. 1. ↑ "Rwanda beaten by England in World U17 opener". BBC Sport. 20 June 2011. Retrieved 21 June 2011. ↑ "England Under-17s to face Germany in the quarter-finals of the World Cup following victory over Argentina on penalties". Goal.com. 1 July 2011. Retrieved 14 July 2011. ↑ "Shock England call for trio". Sky Sports. 10 September 2012. Retrieved 10 September 2012. ↑ "England 1–1 Ukraine". The Football Association. 11 September 2012. Retrieved 1 October 2012. ↑ "Liverpool winger Raheem Sterling called up to England U21 squad". BBC Sport. Retrieved 3 October 2012. ↑ "Serbia U21 0–1 England U21". BBC Sport. Retrieved 16 October 2012. ↑ "England Under-21s thrash Scotland 6–0 in friendly". BBC Sport. 13 August 2013. Retrieved 13 August 2013. ↑ "Sweden 4–2 England". BBC Sport. 15 November 2012. Retrieved 15 November 2012. ↑ "Hodgson impressed by England's young lions". Special Broadcasting Service. 6 March 2014. ↑ "Henderson hails 'fearless' Sterling after winger's man-of-the-match performance for England". Liverpool Echo. 6 March 2014. ↑ "Wilshere & Oxlade-Chamberlain in as Hodgson names youthful England 2014 World Cup squad". Goal.com. 12 May 2014. Retrieved 12 May 2014. ↑ McNulty, Phil (4 June 2014). "Raheem Sterling was sent off and Alex Oxlade-Chamberlain suffered a worrying knee injury as England produced a mixed display to draw with Ecuador in their World Cup warm-up game in Miami". BBC Sport. Retrieved 4 June 2014. ↑ "Antonio Valencia 'sorry' after sending off in clash with Raheem Sterling". The Daily Telegraph. London. 5 June 2014. Retrieved 5 June 2014. ↑ "Valencia sorry for grabbing Sterling". ESPN FC. 5 June 2014. Retrieved 5 June 2014. ↑ "England v Italy: How Roy Hodgson's men rated in Manaus". BBC Sport. 15 June 2014. Retrieved 16 June 2014. 1 2 McNulty, Phil (27 March 2015). "England 4–0 Lithuania". BBC Sport. Retrieved 4 April 2016. 1 2 McNulty, Phil (9 October 2015). "England 2–0 Estonia". BBC Sport. Retrieved 4 April 2016. ↑ Fifield, Dominic (31 May 2016). "England's Euro 2016 squad: the 23 picked by Roy Hodgson". The Guardian. Retrieved 23 September 2017. ↑ "England World Cup squad: Trent Alexander-Arnold in 23-man squad". BBC Sport. 16 May 2018. Retrieved 17 May 2018. ↑ Cole, Jackson (15 October 2018). "Raheem Sterling ends his England goal drought in superb style". talkSPORT. Retrieved 18 October 2018. ↑ "Raheem Sterling growing into elite striker, Brendan Rodgers says". ESPN FC. Retrieved 11 January 2015. 1 2 Fifield, Dominic (7 September 2014). "Raheem Sterling can be as good as Marc Overmars, says Wayne Rooney". The Guardian. London. Retrieved 1 March 2016. ↑ "Raheem Sterling is maturing into a proper striker at Liverpool, insists Brendan Rodgers". The Daily Telegraph. London. Retrieved 21 October 2015. ↑ "Raheem Sterling growing into elite striker, Brendan Rodgers says". ESPN FC. Retrieved 21 October 2015. ↑ "Liverpool's Raheem Sterling good enough to play for Barcelona, says Xavi". The Guardian. London. 11 November 2014. Retrieved 15 November 2014. ↑ Atwal, Sanjit (11 November 2014). "Emperors & Empires: Barcelona's Xavi discusses the modern game in exclusive interview". Squawka News. Retrieved 19 November 2014. ↑ McNulty, Phil (1 April 2015). "Raheem Sterling is not the finished article at Liverpool". BBC Sport. Retrieved 1 April 2015. ↑ "Liverpool FC's Raheem Sterling happy to keep taking the hits – so long as he's contributing to goals". Liverpool Echo. 22 January 2013. Retrieved 16 September 2018. 1 2 "Raheem Sterling: Liverpool winger bids to shed bad boy image". BBC Sport. 28 March 2014. ↑ De Menezes, Jack (9 August 2013). "Liverpool winger Raheem Sterling arrested on charge of assault". The Independent. London. Retrieved 12 April 2017. ↑ "Liverpool's Raheem Sterling cleared of assault on former girlfriend". The Guardian. London. 20 September 2013. Retrieved 12 May 2014. ↑ "Raheem Sterling: Liverpool star alleged to have taken laughing gas". BBC Sport. 14 April 2015. Retrieved 14 April 2015. ↑ Ornstein, David (15 June 2017). "Grenfell Tower fire: Man City winger Raheem Sterling to make donation". BBC Sport. Retrieved 22 August 2018. ↑ "Raheem Sterling: hooligan admits racially aggravated attack on Man City winger". BBC Sport. 20 December 2017. Retrieved 20 December 2017. ↑ Barney Ronay (22 December 2017). "Abuse of easy target Raheem Sterling leaves bitter taste in mouth". The Guardian. Retrieved 22 December 2017. ↑ "England striker defends gun tattoo". BBC News. 29 May 2018. ↑ "Raheem Sterling: Manchester City winger is targeted by racism, says Ian Wright". BBC Sport. 13 August 2018. Retrieved 13 August 2018. ↑ Mcleod, Maurice (30 May 2018). "As Raheem Sterling knows, successful black men have targets on their back". The Guardian. Retrieved 13 August 2018. ↑ Stopes, Harry (6 July 2018). "The Press v. Raheem Sterling". London Review of Books. Retrieved 13 August 2018. ↑ "Mediawatch special: Sterling, The Sun and racist attacks". Football 365. 29 May 2018. Retrieved 13 August 2018. ↑ Media Mole (29 May 2018). ""Disgraceful and borderline racist": the Sun takes issue with Raheem Sterling, yet again". New Statesman. Retrieved 13 August 2018. ↑ Adoo, Edward (30 May 2018). "Let's be honest: we wouldn't draw a natural connection between Raheem Sterling's tattoo and gang violence if he was white". The Independent. Retrieved 13 August 2018. ↑ "Raheem Sterling Wears the Nike GS2". Football Boots. Retrieved 26 November 2012. ↑ "Nike GS2 Football Boots". FootballBoots.co.uk. Retrieved 26 November 2012. ↑ "Nike Mercurial Vapor IX – Raheem Sterling". Copa90. 17 January 2013. Retrieved 16 September 2018 – via YouTube. ↑ "Games played by Raheem Sterling in 2011/2012". Soccerbase. Centurycomm. Retrieved 7 December 2014. ↑ "Games played by Raheem Sterling in 2012/2013". Soccerbase. Centurycomm. Retrieved 7 December 2014. ↑ "Games played by Raheem Sterling in 2013/2014". Soccerbase. Centurycomm. Retrieved 7 December 2014. ↑ "Games played by Raheem Sterling in 2014/2015". Soccerbase. Centurycomm. Retrieved 15 July 2015. ↑ "Games played by Raheem Sterling in 2015/2016". Soccerbase. Centurycomm. Retrieved 29 May 2016. ↑ "Games played by Raheem Sterling in 2016/2017". Soccerbase. Centurycomm. Retrieved 20 July 2017. ↑ "Games played by Raheem Sterling in 2017/2018". Soccerbase. Centurycomm. Retrieved 14 July 2018. ↑ "Games played by Raheem Sterling in 2018/2019". Soccerbase. Centurycomm. Retrieved 8 January 2019. 1 2 "Sterling, Raheem". National Football Teams. Benjamin Strack-Zimmerman. Retrieved 8 January 2019. ↑ McNulty, Phil (15 October 2018). "Spain 2–3 England". BBC Sport. Retrieved 15 October 2018. 1 2 "Raheem Sterling: Overview". Premier League. Retrieved 12 December 2018. ↑ McNulty, Phil (28 February 2016). "Liverpool 1–1 Manchester City". BBC Sport. Retrieved 3 April 2018. ↑ McNulty, Phil (24 February 2019). "Chelsea 0–0 Manchester City". BBC Sport. Retrieved 24 February 2019. ↑ McNulty, Phil (14 July 2018). "Belgium 2–0 England". BBC Sport. Retrieved 12 August 2018. ↑ "Suarez bags treble at awards dinner". Liverpool F.C. 6 May 2014. Retrieved 7 May 2014. ↑ "Phil wins four prizes at Players' Awards". Liverpool F.C. 19 May 2015. Retrieved 19 May 2015. ↑ "Premier League Milestones 2018/19 Season". Premier League. Retrieved 17 January 2019. Wikimedia Commons has media related to Raheem Sterling.